by Niall Douglas. Last updated 2004-08-28 00:00:00 +0000 UTC . This page has been accessed 5,630 times since the 8th August 2005. Thursday 26th August 2004: 9.54am. Yes, it is rather early for me to be making an entry and indeed it would have been more normal for me to have been up all night and making it at the end just before bed rather than now which is just after waking. Niall waking at 9am voluntarily? Niall must be mad! Well, to be fair, for most of this summer I was getting up at 10am because Farscape was repeating at that time every morning on SciFi. Unfortunately, they've since stopped Farscape so it's been getting harder - on the other hand, getting up earlier is definitely having effects on how much you can get done, and time is running out. I've got data access more or less done, today I must write another test which does random interleaved locking and reads and writes to try and stress the code to the maximum. 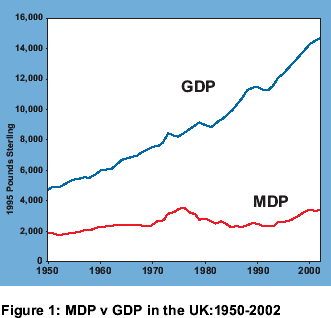 Something interesting I was reading recently is a document from the New Economics Foundation which discusses Measure of Domestic Progress (MDP) versus Gross Domestic Progress (GDP) in the UK and from which I have quoted a small graph to the right. As you can see, real human benefit has barely improved against average income which has risen exponentially at the cost of billions of lives in the ever growing third world (its population growth is slowing down to become reversed soon, but more of the global population are pushed into poverty each year to make way for western GDP increases). One of the major differences in calculating MDP is the difference between rich and poor, and of course this has mushroomed in the last twenty years in the US and UK especially. Ok, it's now actually 1.35pm as I was talking to my sister and father during writing this so I'll get back to work. My ten day holiday in the UK and Bilbao was good but no time to describe it other than that the Basques are to the Spanish as the Irish are to the English (similar on the outside, different on the inside). Be happy!